Our master bathroom started off as one of the least offensive rooms in the house (no carpet, less cigarette smell than the rest), but it still wasn't what we wanted. It had a cramped shower, more of the same awful tile as the downstairs, seashell sinks, a rusty medicine cabinet, and a water closet with the smallest glimmer of privacy (an open doorway through which half of the toilet bowl was visible). Before we even moved in, we removed the tile and were left with perpetually dusty subfloors. 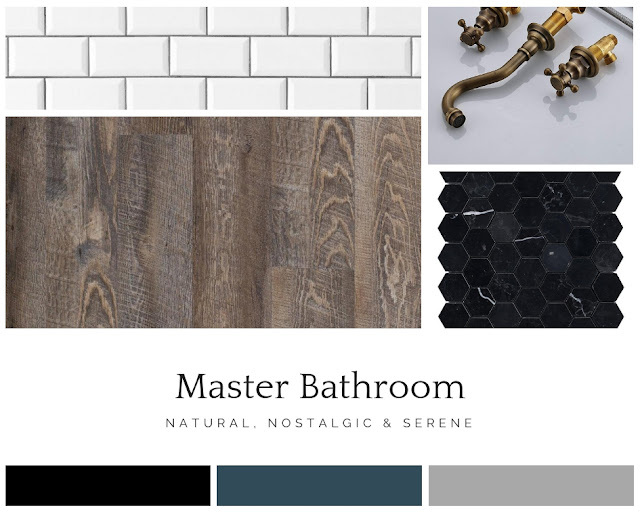 We originally planned to leave the bathroom renovation for close to last, after completing the flooring in the rest of the house and renovating the girls' bathroom and kitchen. It got bumped higher on the list when it occurred to me that while we were in the process of replacing the girls' bathtub, they would be forced to use our shower temporarily. Bathing the girls in our tiny shower would be a nightmare; the enclosure was very small, too small for two people, and if we left the glass door open to wash their hair, water would pour all over the plywood subfloor. Our eventual plan for the room was always to extend the shower into a walk-in style (no door), and to add a hand sprayer for washing the dog (and last minute leg shaving for when I realize right before heading out the door that I forgot, which happens more often than I'd care to admit). That larger shower and hand sprayer should make the girls' hair washing even easier than usual. I have a feeling I'll end up adding a hand sprayer to my wishlist for their bathroom. Choosing finishes for the bathroom was really easy. I had already decided that our floors would be the same throughout the house. We went with luxury vinyl planks from Floor and Decor's Duralux Performance line, in Lenox Estate Oak. I love that they are a nice midtone gray-brown. They'll be in every single room, with absolutely no thresholds anywhere. As for the shower, white subway tile with dark grout was a no brainer. We decided to splurge and use black marble hex tiles on the shower floor, and we are planning to use soapstone for the bathroom counters. We've already ordered two brass wall mounted faucets and two porcelain rectangle vessel sinks for the vanity. ( Rozin Bathroom 2 Knobs Widespread Basin Faucet Wall Mounted 3 Holes Vanity Sink Mixer Tap Antique Brass ) I haven't selected mirrors or sconces yet, because first I want to see how the things we've already purchased feel once they're installed. The hardest decision for me has been how to add privacy to the toilet enclosure. I've been flip-flopping between a pocket door, a sliding barn-style door, or no privacy at all (which I only ever consider for 30 seconds before remembering how much I don't want to see a toilet from our pretty new bathroom, and how much I want to be able to do my makeup while the toilet is in use). I'm taking it day by day, and visiting our local Habitat ReStore occasionally to see if I find myself falling in love with any special door that solves all my problems the privacy dilemma. As of today, we've finished demolishing the bathroom (except for the toilet, which we'll replace on floor install day) and installed a new drain line. Then we got sidetracked by our PEX install, which I'll be posting about next! Today when Patrick gets home from work, we're planning to start putting the bathroom back together, beginning with framing in the new shower and adding cement board. Hopefully by Wednesday we'll get to start pouring the shower pan!